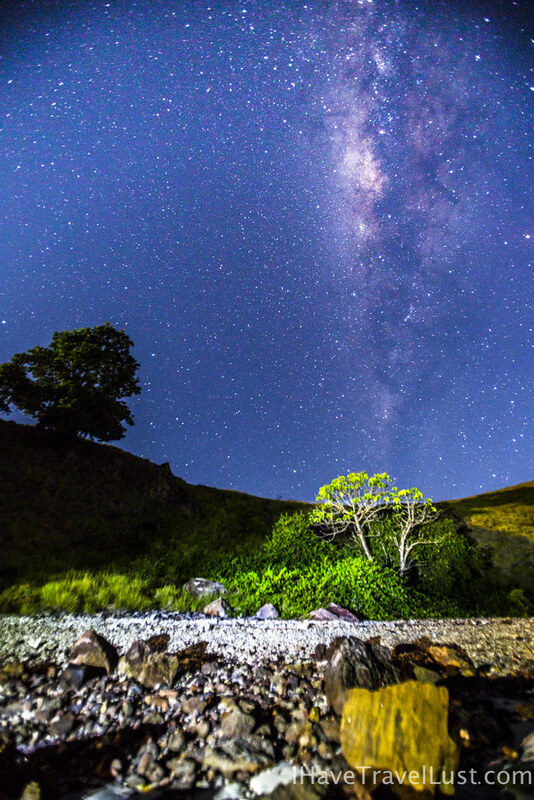 The dark night skies are rare these days, even in many parts of the remote world we live in. As more people start living in these parts, electricity follows, filling the dark skies with their bright orange light. 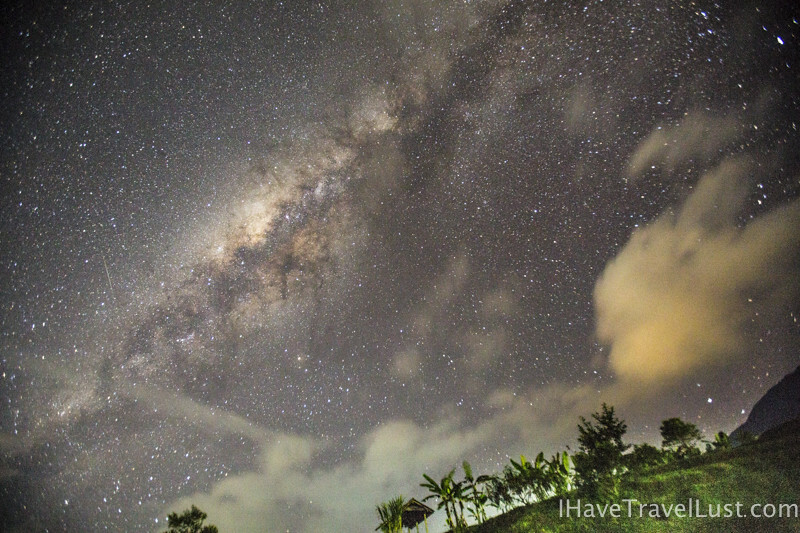 Became obsessed with photographing the Milkyway and the night skies. 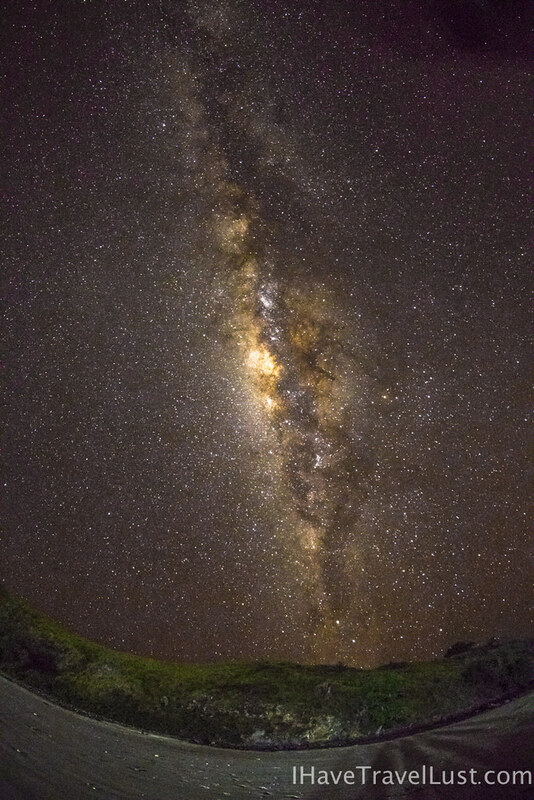 My first image of the milkyway was a mistake shot while photographing the landscape in the chilly nights of Bolivia Salt Plains. I never knew it could exist in my camera. It looked very much like clouds with naked eye. How wrong I was about the cloud that turned out to be the milkyway, and that cloud was seen through my camera yet I was unable to see it with my eyes. 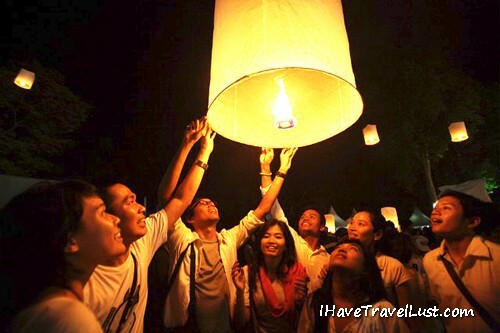 Living in the city where it is bright at night has created a yearning within me. I loved the night skies and the stars. 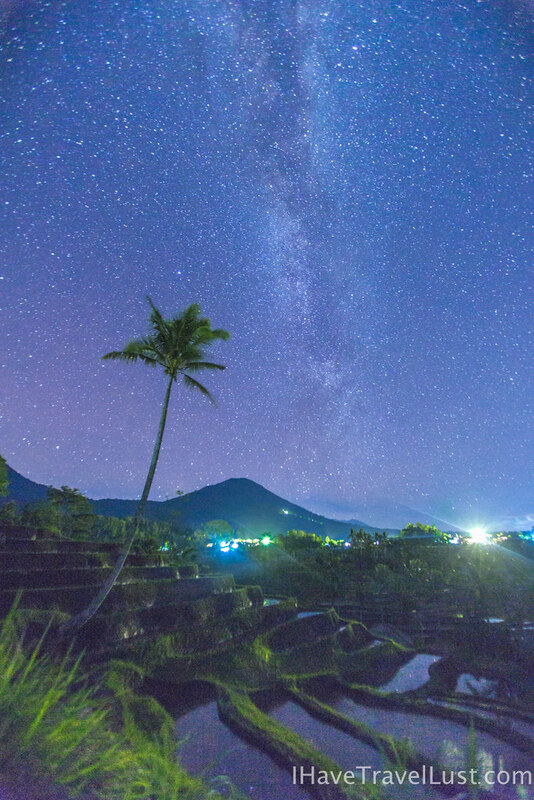 Light pollution is bad everywhere, night photography is not easy even in remote parts these days, where a tiny amount of light can affect the quality of star gazing. 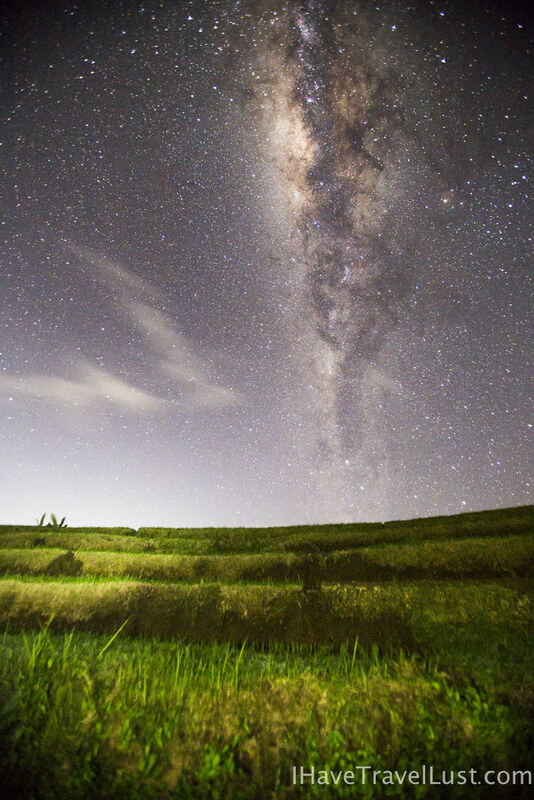 Staring into the milkyway is mesmerising to think we are part of this awesome galaxy. 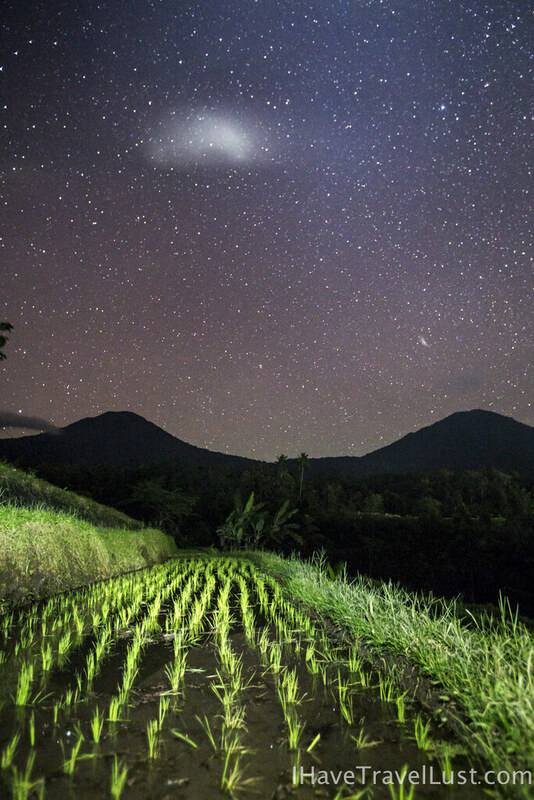 Bali, Indonesia became a place for me to experiment, especially at Jutiluwati Rice Terraces. Had not planned for a shoot, the moon was pretty bright and the surrounding villages were all lit up during a pretty windy and cloudy sky. 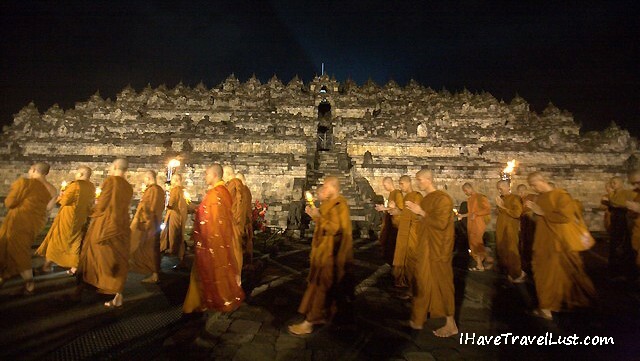 6 May 2012 : Vesak day or Buddha Enlightenment day in Borobudur temple, the 9th century Buddhist Temple in Indonesia. 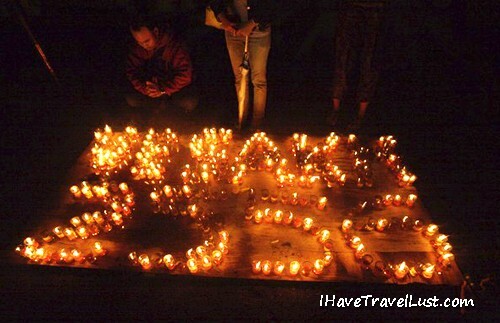 The ceremony coincide with once-a-year cosmic event of the perigee moon. 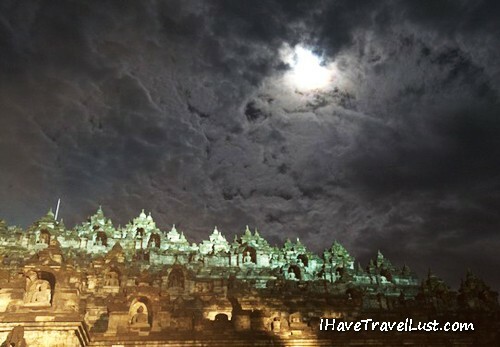 Also known as the Supermoon, where the moon is the closest to Earth. 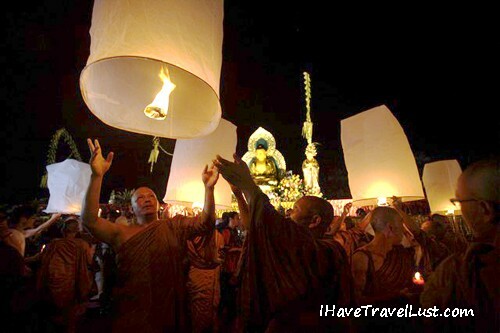 The Vesak event was celebrated with buddhists from all over South East Asia, making their yearly pilgrimage to this tourist site. It rained heavily for the whole day and magically stopped just as the ceremony started. 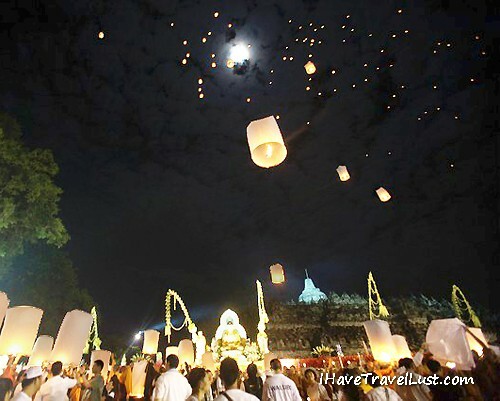 The crowded event had buddhist monks circling the Borobudur temple and releasing lanterns at the end. 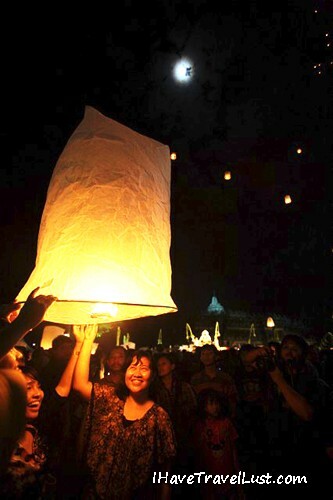 UBUD, Indonesia — In a roar of orange flame, the body of Agung Suyasa, head of the royal family of Ubud, was reduced to its earthly elements on Tuesday, liberating his soul to fly upward, in a spray of sparks, through the night sky to the heavens. 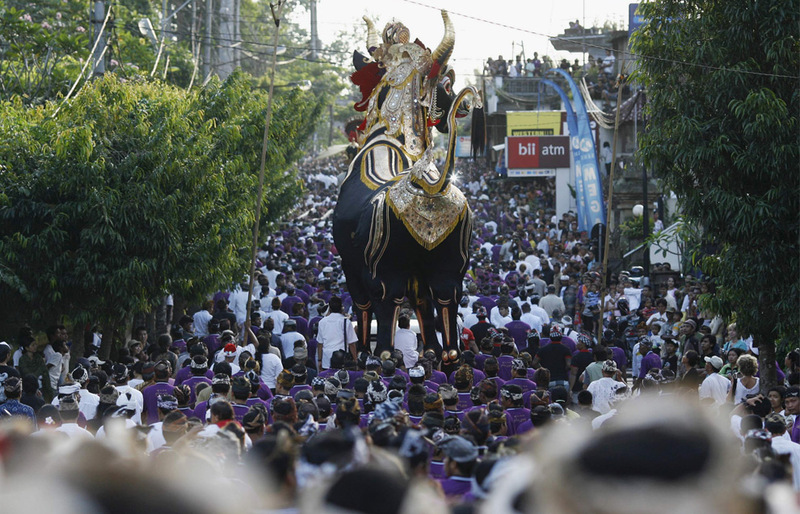 In the most spectacular royal funeral in Bali in at least three decades, the energy, mysticism and creativity of this Hindu island came together in the mass cremation of three royal figures and 68 commoners. 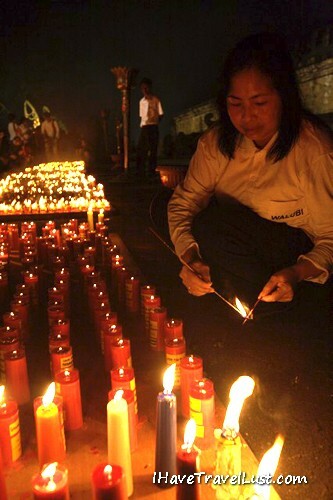 It was the highest moment — but not the final one — in months and sometimes years of funerary rites as bodies were buried or preserved waiting, according to local belief, for their souls to be freed through cremation. 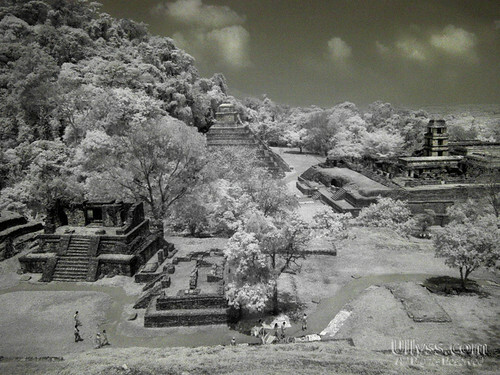 The bodies of the commoners had waited to join Mr. Suyasa and two other members of his extended family in a royal cremation, although the pyres of the commoners were in a separate location. 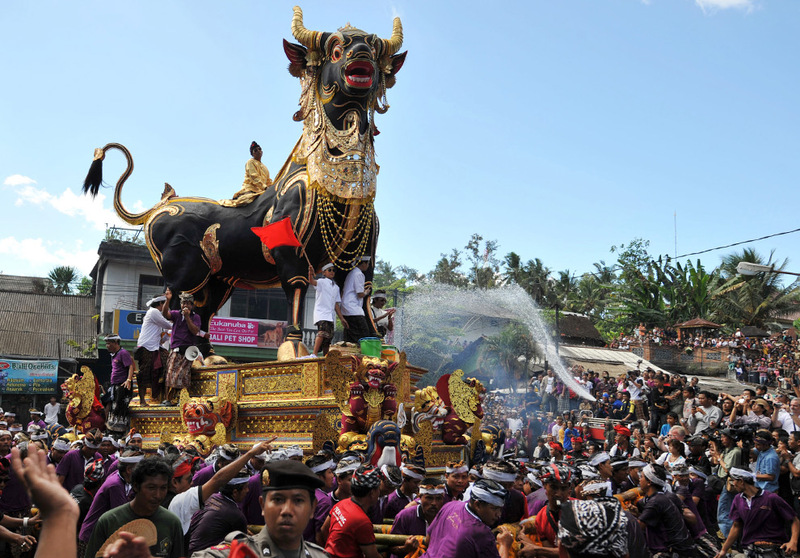 All were on a journey of purification and renewal in which, according to Balinese tradition, the soul can return to inhabit a new being, generally a member of the same family, until, once again, it is freed through cremation. 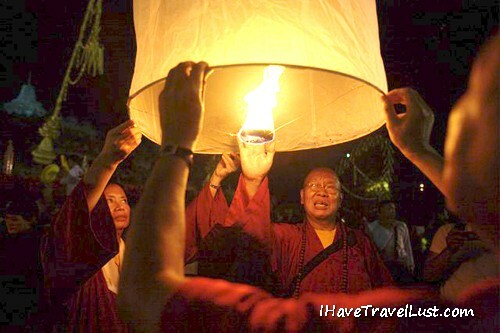 In the coming months, more ceremonies lie ahead, to further cleanse both the soul of the departed and the people left behind. 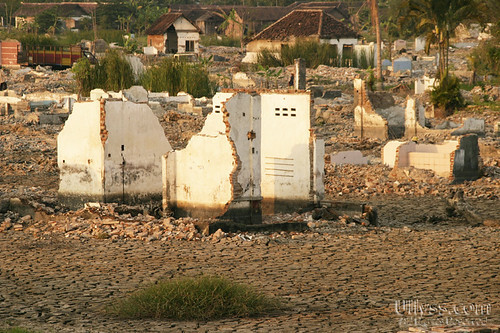 “None of us is brand new,” said Raka Kerthyasa, the younger half-brother of Mr. Suyasa. 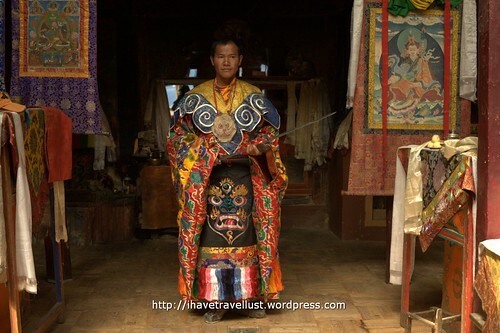 Mr. Kerthyasa oversaw the cremation and is now the guardian of the ancient but symbolic royal family. “We are part of the cycle of life,” he said. 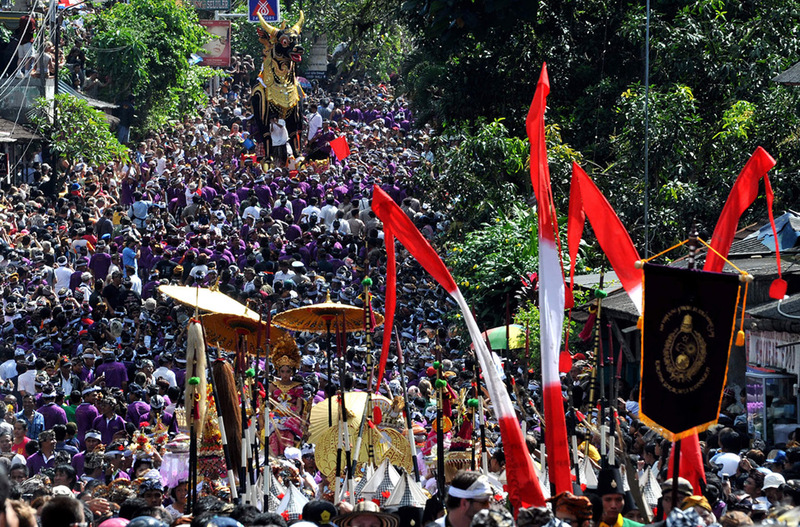 That ever-changing cycle may one day claim the cremation rites themselves, and some here say that in the face of a globalizing world, Bali may never again see a cremation ceremony to match this one. 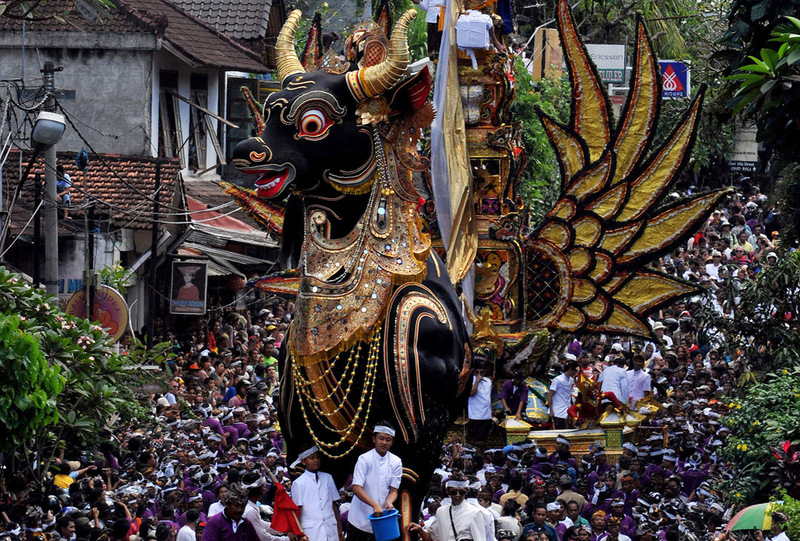 “They’ll have things in the future, but elaborate and grand like this one, I don’t think so,” said I Nyoman Suradnya, an artist, whose older brother was one of the commoners cremated Tuesday. In that spirit, Tuesday was a day of raucous energy as thousands of volunteer porters in purple shirts carried the giant emblems of the ceremony like armies of ants bearing impossibly large objects. Hunched under a giant bamboo platform, 200 at a time for 100-yard shifts, the porters bore an 11-ton tower, as tall as a three-story building, that carried the coffin of Mr. Suyasa under a nine-tiered pinnacle. Whooping and laughing, sometimes breaking into a run, the porters swung the platform crazily from right to left to confuse the spirits. Along with it came a huge, undulating dragon, terrifying to behold with its bulging eyes and splayed teeth. 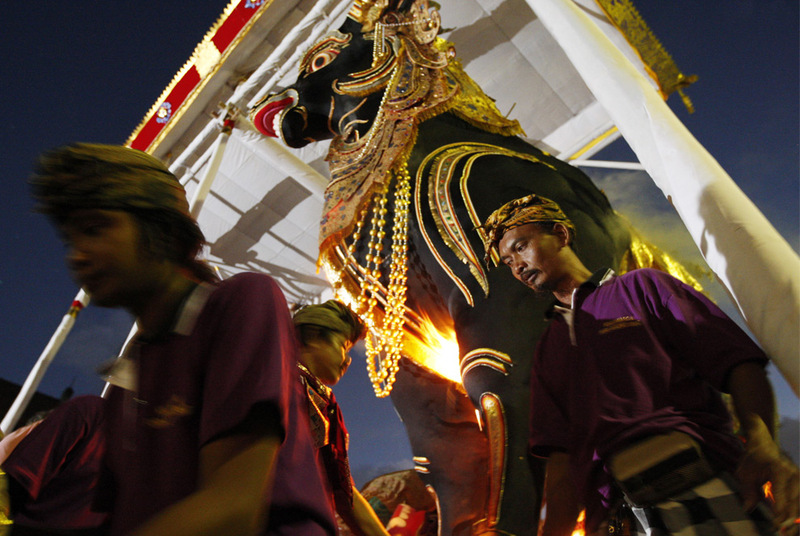 After that came a giant black, wood bull, hung with gold necklaces, that would serve as the sarcophagus at the cremation. 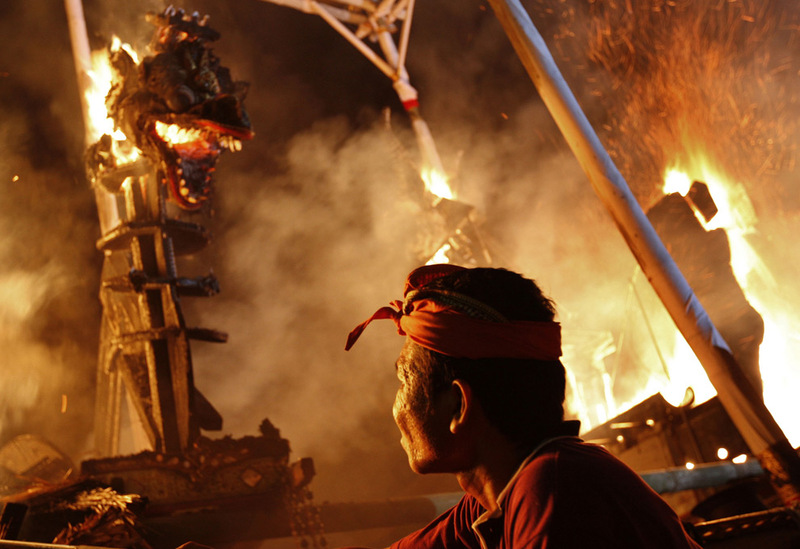 “Strange as it seems, it is in their cremation ceremonies that the Balinese have their greatest fun,” wrote Miguel Covarrubias in his classic work, “Island of Bali,” published in 1937. “A cremation is an occasion for gaiety and not for mourning, since it represents the accomplishment of their most sacred duty” to liberate the souls of the dead, he wrote. For most of the time since Mr. Suyasa died on March 28, his body had been lying embalmed, as if asleep, in his palace. The family brought daily offerings and symbolic meals. Coffee and tea were prepared by the bier. A comb, toothbrush and mirror were kept handy nearby. On Tuesday, poised between heaven and earth, his white and gold coffin entered the cremation site in the funerary tower, which glided on the backs of its 200 porters as smoothly as if it were on ice. 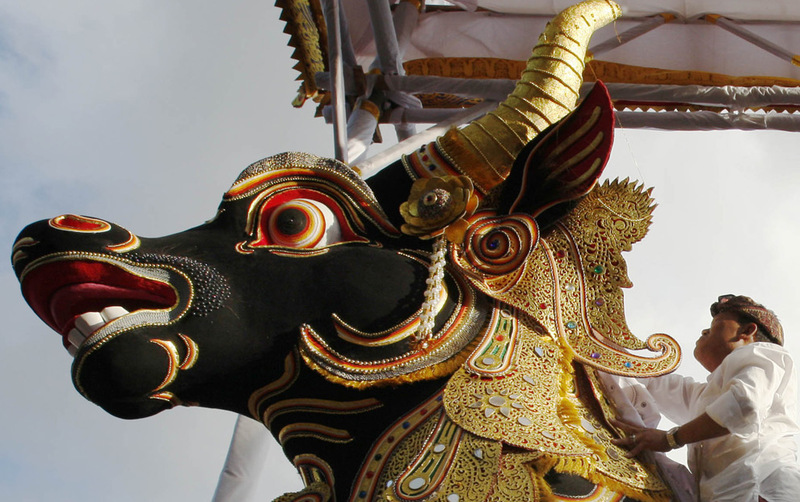 Porters carried the coffin down a soaring white chute, then paraded it three times around the waiting bull, trailed by men and women with pyramids of offerings on their heads. 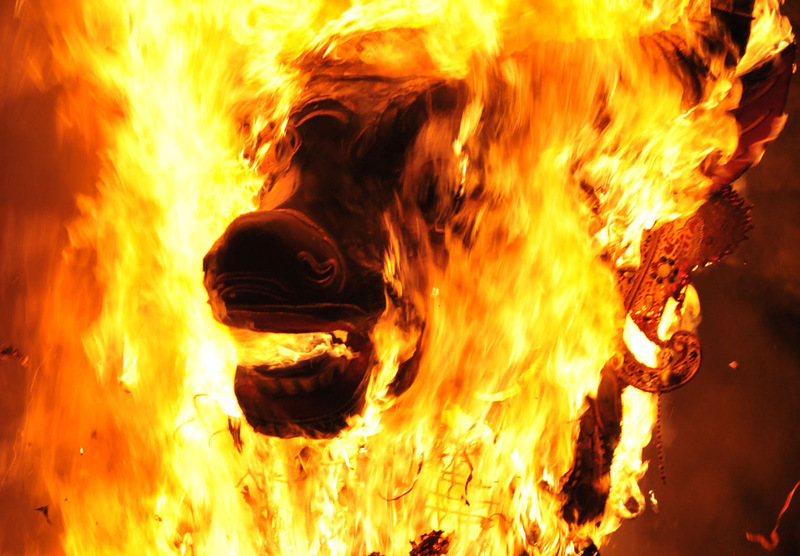 On the crematory platform, the hollow back of the bull was opened and the body was placed inside, its final stop on its earthly journey. 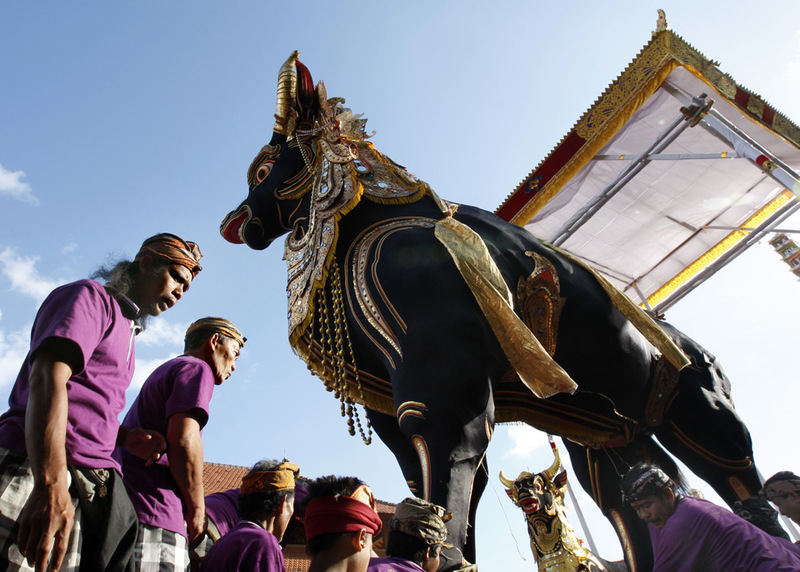 A second, smaller bull stood by its side holding the body of another royal relative, Gede Raka. 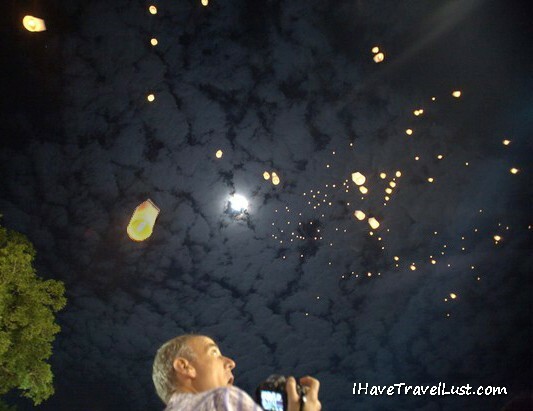 The sun was sinking as the back of the giant bull was closed and the crematory plaza, packed with thousands of onlookers, twinkled with the flashes of cameras. Suddenly bright shoots of flame appeared under the belly of the bull, quickly caught the gold necklaces and traveled upward. 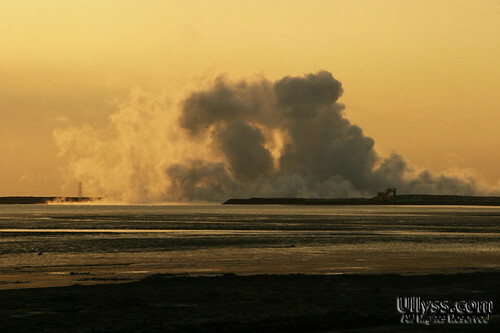 Smoke seemed to pour from its nostrils and flames shot from its eyes. Its curved horns and ears were on fire. 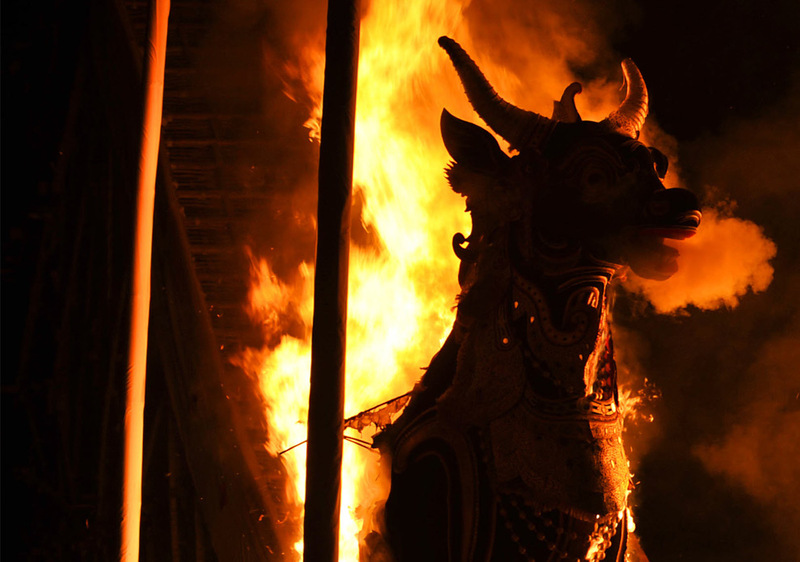 As the bull fell away, the iron bars that formed its frame remained, and within them hung the burning skeleton, its skull tilted downward, its right foot spurting flames. 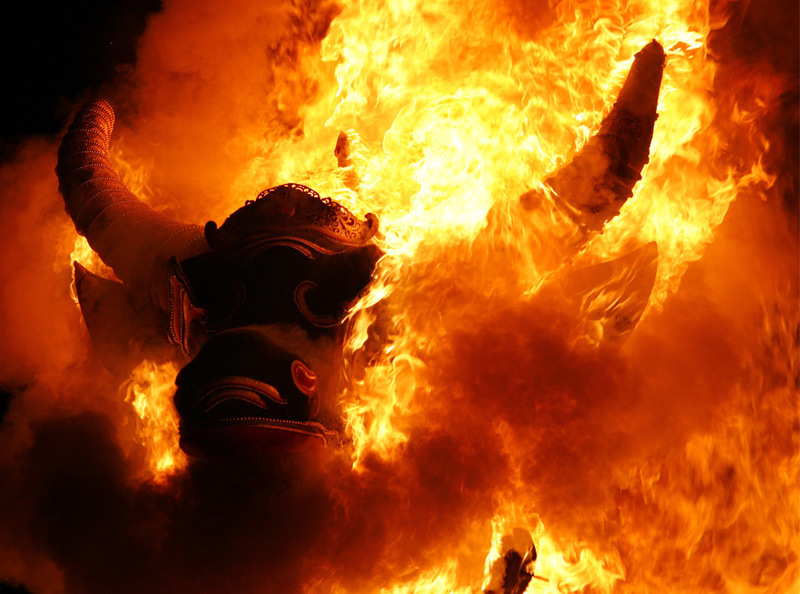 Acting with ritual disrespect for the now-useless body, workers poked and prodded at it with long bamboo poles to stoke the fire, and it swayed slightly in the flames. 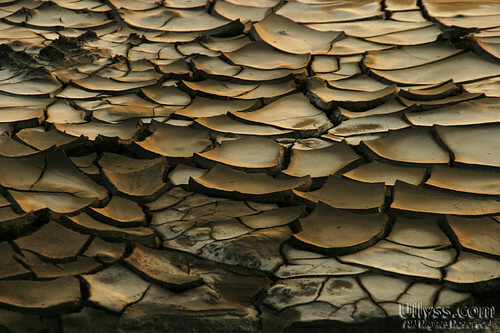 The body disintegrated into its five earthly elements: earth, wind, water, fire and ether. Its soul disappeared into the night sky. One of Mr. Suyasa’s sons, Indrayana, sat on the ground nearby, dressed in ritual gold, holding his hands in prayer toward his father. Then, fire to fire, he put a match to a cigarette, looked up, and inhaled. 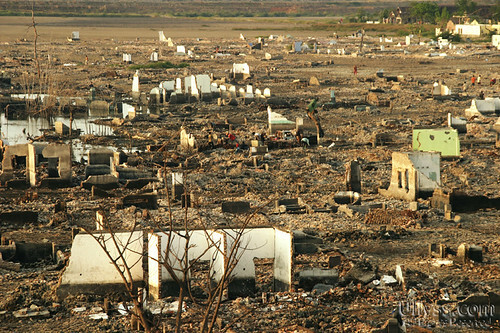 On 28 May 2006, an industrial gas drilling company initated a torrential hot volcanic mudflow which would inundate villages and rice paddies, displacing more than 11,000 people from eight villages in the Porong district, Sidoardjo. 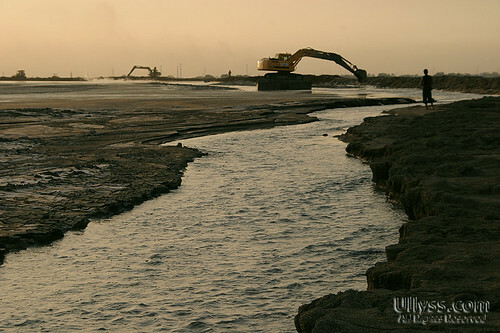 Two years on my June 2008 travels, when we visited the place briefly, there were some industrial work going on, probably related to the gas exploration works since the gas pipelines were still in operations. 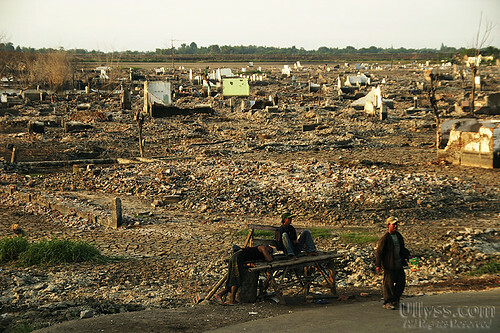 As far as my eyes could see, the ruined villages were still covered by the mud, nothing has yet to be done to the area. Some people were still living in tents and have turned to begging in the streets. 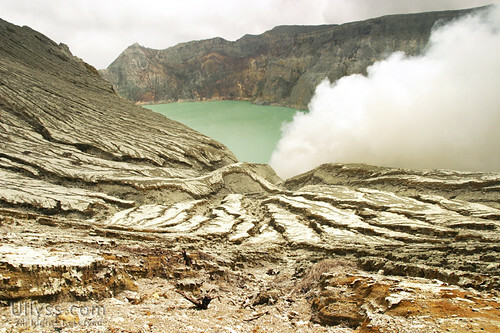 The active caldera still releasing hot vapour gaseous. I found a national geographic article which would give you more details of the whole situation. You can read it here. 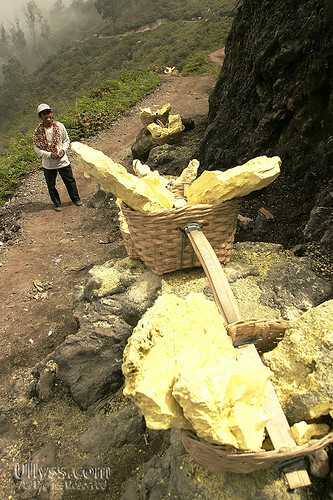 These slags of sulphur are look deceivingly light, but highly densed in masses, each basket would weigh an average of 80kg. 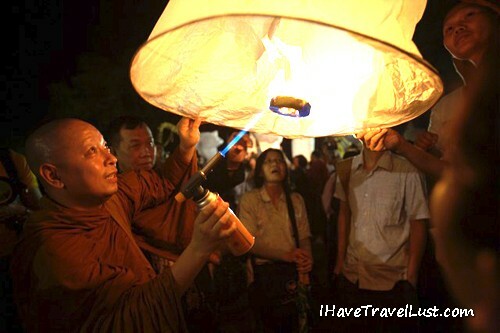 If you do visit the place, go in the early morning, before sunrise, you will get to see the miners carrying their torches. The weather is much gentler and you probably could see the crater before it gets covered by the fumes. We only got to volcano after 8am, by then, the turquoise blue lake was covered. 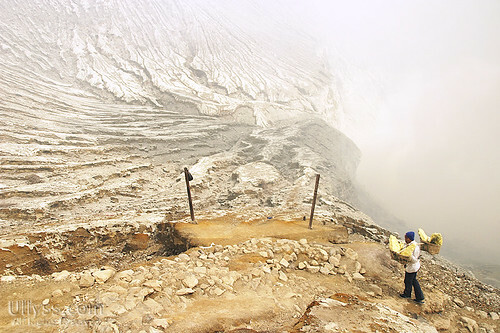 It takes 1.5hours to climb down to the base of the crater. I gave up halfway, the sulphur dioxide fumes proved too piercing to my lungs and eyes. 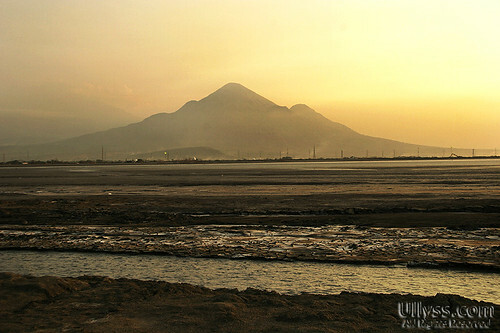 My throat was sore for the whole day after only spending few hours up the volcano. 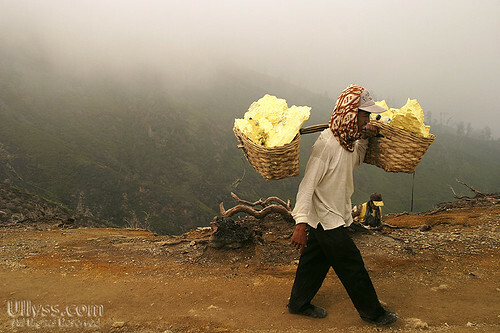 It is amazing how these sulphur miners carry their heavy 80-100kg load of sulphur up and down the crater and breathing and working in unbearable conditions filled with sulphur dioxide fumes. The visibility was quite limited and only every once in while does it clear a little to reveal a few moments of the lake. Many of these miners worked til their late forties, it was one of the better paying jobs in the impoverished region. 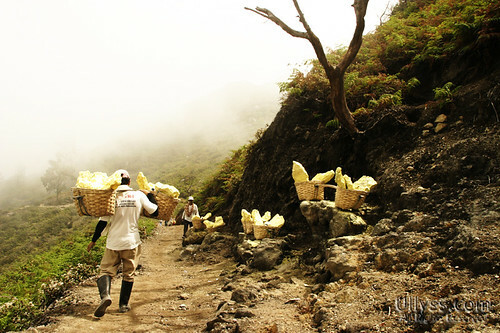 Each of them start making their ascent up the volcano in the dark, a few hours before dawn and ending their work just before sunset. Its tough work but for many of them, this is the only way to feed their familes. Base of the crater, every or so moment, it clears a little to reveal the base of the crater. 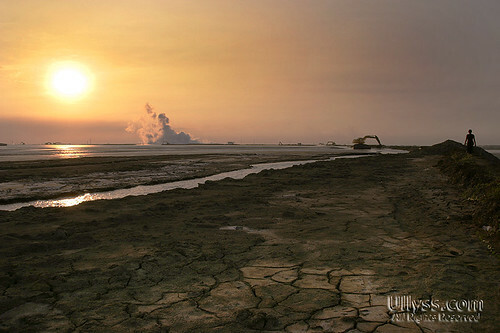 This is where the miners work, breaking up pieces of sulphur. 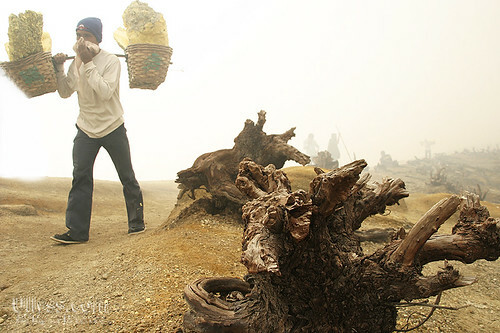 Nothing lives up here, even the trees died, poisoned by the lethal fumes of sulphur dioxide. Where the wind blows across the top of the rim, it becomes unbearable and almost unbreathable. The miners have no more than their clothes to cover their mouths, little use to protect them from the accumlative toxic fumes. Most of them would not live past their 50s. 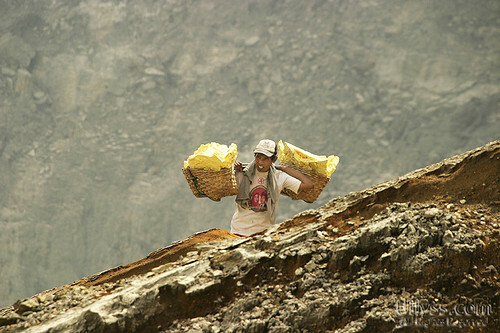 A miner making his way up the ardous rim from the base of the crater, carrying an average load of 80-100kg. Climbing down the rim and ascending up the rim is dangerous enough, not to mention carrying beyond human weights. 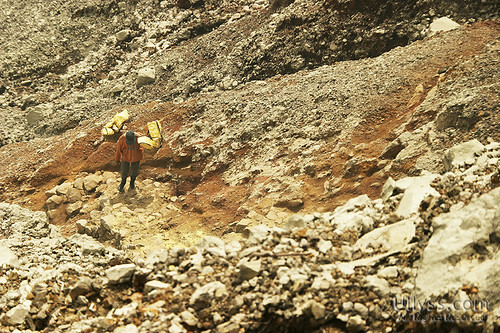 Midway down the outer volcano, a young miner checks the weight of his load. He gets his money based on the amount of sulphur he brings down. The weighing station in the middle of the volcano route. 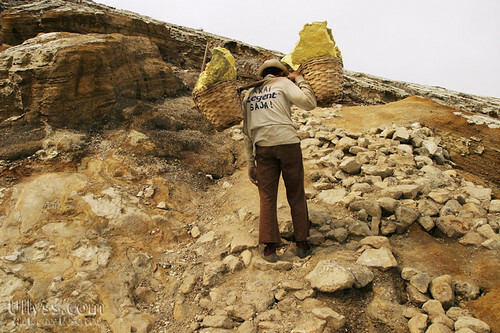 This is where some of the sulphur is collected and weighed before making its way down to the main collection office. Each Miner has his own load of sulphur. 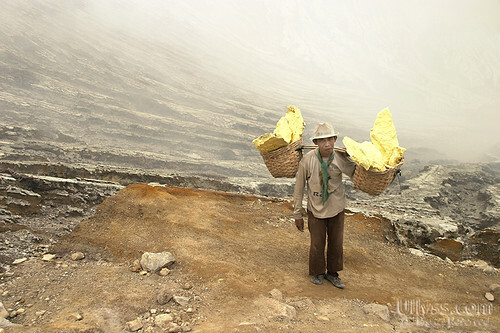 He collects and gathers his baskets of the sulphur up from the crater rim before making the steep descent down the hill. 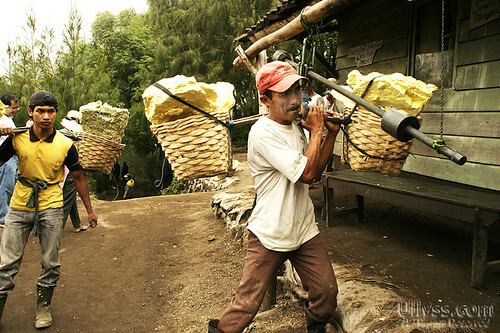 It is amazing how these miners could carry loads than more than double their body weights. Such a beautiful and surreal place. It took some patience taking this image. The wind would blow in my direction covering the whole place with the odourous fumes. Only every now and then does the torquiose lake reveals itself for a few seconds before covering it again with the sulphur smoke. Its only a 3km accent up and yet took me an incredible 2 hours to climb up! Oh How unfit am I! 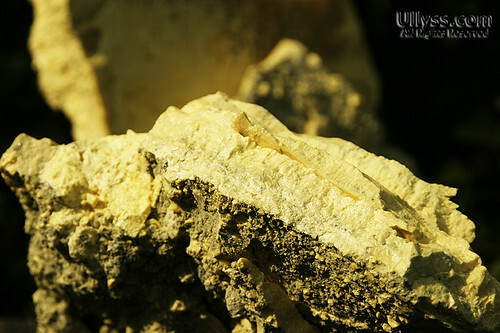 The Mined Sulphur on closeup. 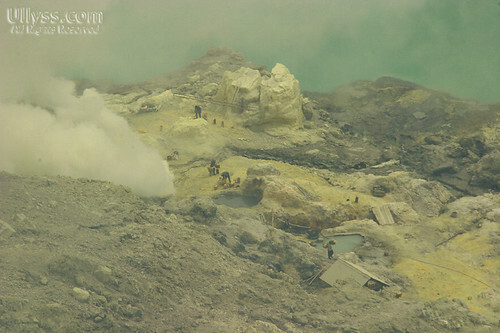 Sulphur miners in the fume covered crater. 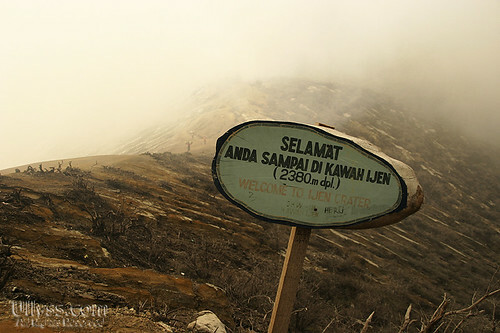 Finally I reached the crater rim, only to be greeted by this post telling me that there is more to climb if you can withstand the throat burning sulphur dioxide fumes, you could walk up the top of the volcano, or descent to the base of the crater which would take you another 1.5 hours. 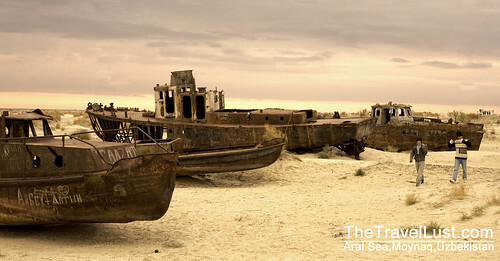 Amazing surrealist landscape which looks almosts alien and breathtakingly beautiful. 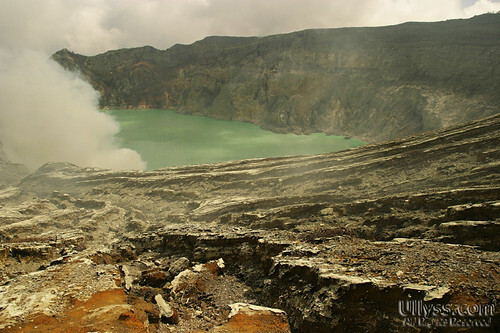 This surreal place it takes at least 2 hours of steep ascent to the top of the crater, gives a spectacular view of the torquiose colored lake down below the crater. 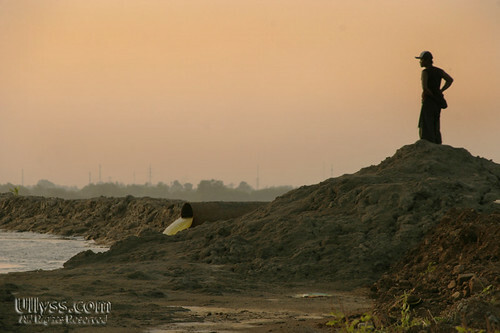 This is where the local men work as back-breaking sulphur miners. 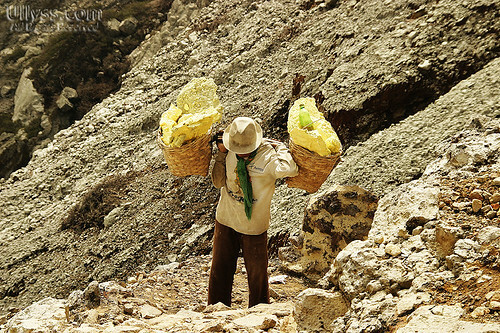 They suffer toxic stinging sulphur fumes and endure the steep trek up the crater and dangerous descent down to the lake. 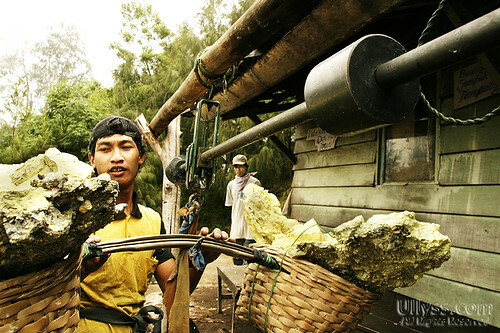 The sulphur is use for whitening sugar and processing rubber. The miners apparently earn around 5,000rp per load according to my travel partner who interpreted it, although there was some dispute about it later on. It was a little challenging to walk up the volcano, takes a little persistent steady pace to reach there in 2 hours. Am not really that fit a person, a much fitter person could do it in 1.30 hours. It took me 1.30 hours down the volcano. 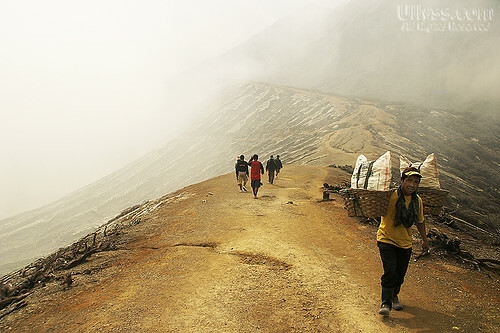 It would take another 1-2 hour for me just to walk down to the base of the crater. Regretted not going there early before sunrise so I could have more time to walk down the crater where the miners break up sulphur pieces. It was quite a difficult descent down the crater, only managed a little bit down before surrendering to the stinging fumes of sulphur dioxide. 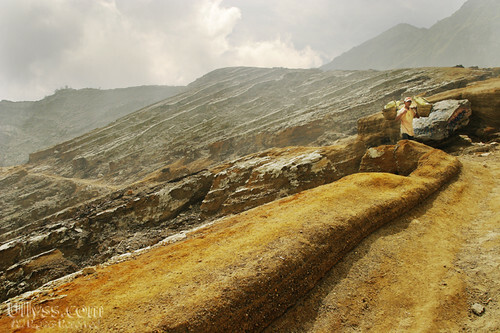 There’s a national geographic documentary on the Sulphur Miners of Ijen which gives you more details. 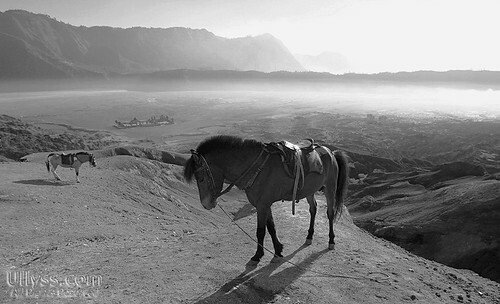 Here’s the legend of how the Tenggerese came to live in Mount Bromo. 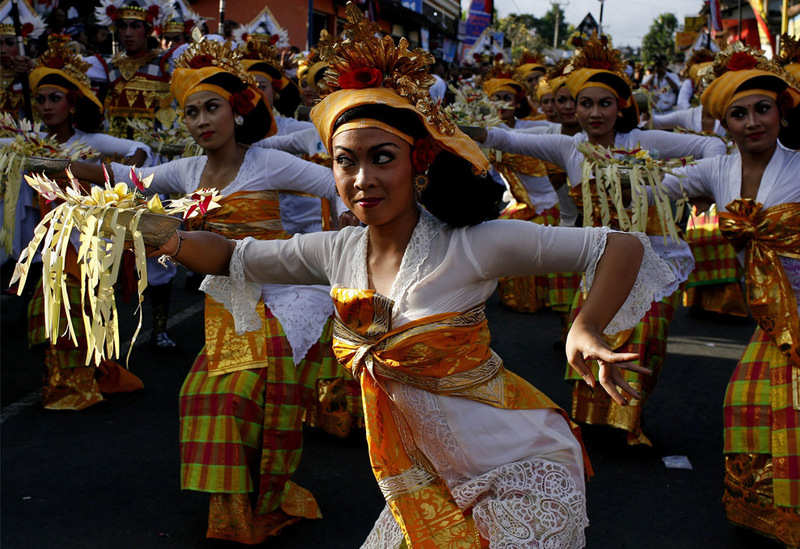 A long time ago, there lived a beautiful woman by the name Roro Anteng. She was a reknown beauty and had attracted the attention of an evil giant. Because the evil giant possessed extraordinary magical powers, Roro Anteng dared not reject the giant’s advances when he proposed to her. Roro thought of a plan to get away from the marriage without offending the giant. In order to get her hand in marriage, the giant had to fufill her wishes. Roro then concocted a difficult request in hopes that the giant did not have the power to fufill it. She had asked him to make her a sandy desert in between the mountains in one night and before the break of dawn. Unfortunately for her, the giant magically and swiftly begin to work his powers and was near completing her wishes. The fast thinking Roro Anteng quickly thought of an idea to disrupt the completion, she made all sorts of noises that woke up the roosters. The roosters began to crow bringing dawn in. On hearing the rooster’s calls, which signalled the break of dawn, the giant was shocked for having failed his task. 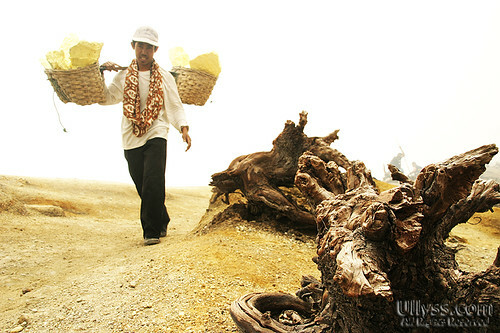 Frustrated, he threw the coconut shell that he used to dig the desert, the shell fell to the ground beside Mount Bromo, forming what is now knows as Mount Batok (coconut shell). 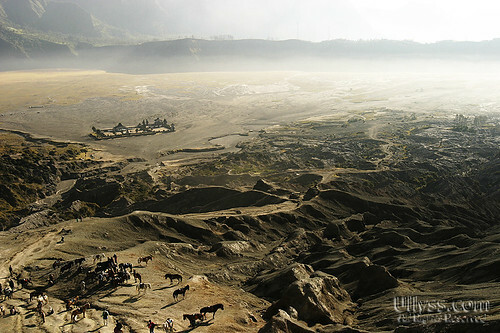 The sandy plain was to form the Tengger caldera. The story continues with Roro Anteng falling in love with Joko Seger, a descendant of the great Majapahit Kingdom who had led a reclusive life on the desolate mountain range. They were married, living happily blessed with many children. 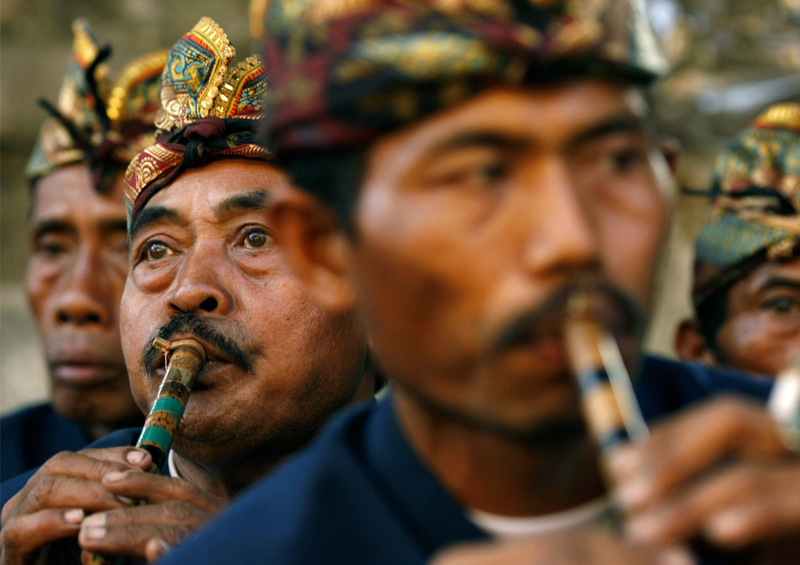 Their children and their descendents formed the tribal community of the Tengger (taken from the names ‘Roro Anteng’ and Joko Seger”). 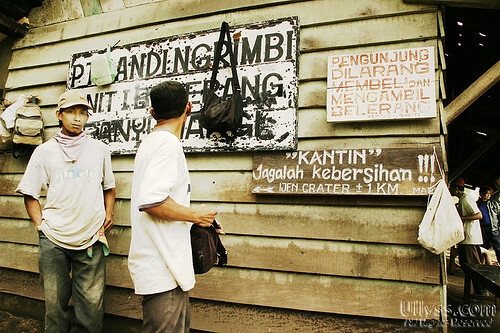 This was the story of how the Tenggerese tribe came to be and how they lived the lands. 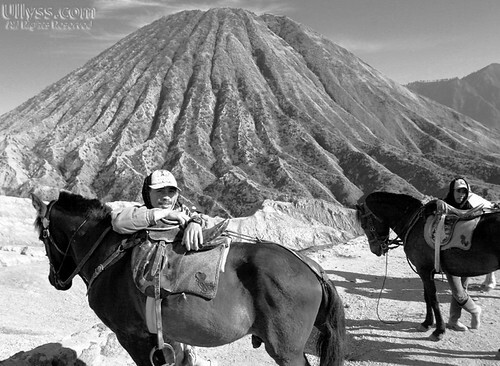 These Tenggerese Horsemen live on the edge of a magnificent million-year-old caldera with four dormant and active volcanic peaks. 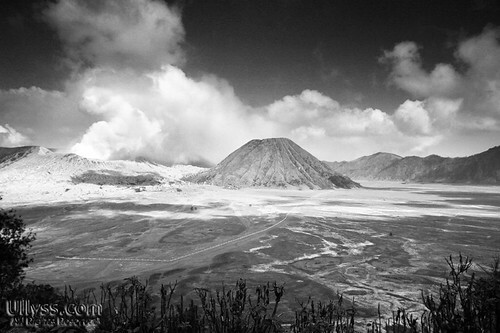 Mount Bromo is one of the active volcanoes in Indonesia. 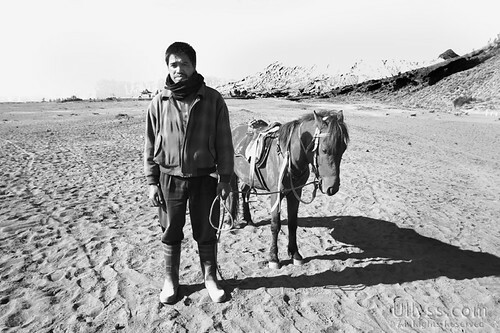 For centuries, the Tenggerese lived off the rich volcano soil with substance farming, horses only came to the land 200 hundred years ago and became an integral part of the Tenggerese culture. 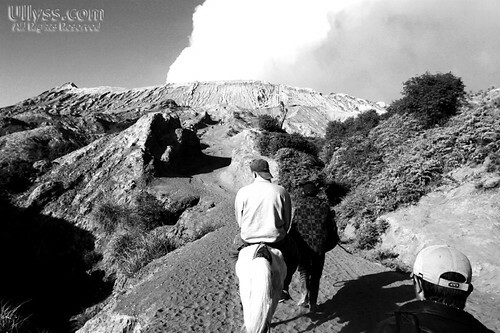 Nowadays, these Tenggerese Horsemen takes tourists up the Volcano daily basis, the average trip up the volcano will cost you 20,000rp – 40,000 depending on your bargaining skills. These horsemen start working at 4am and returns back to their regular jobs after 10am when all the tourist leaves. It gets too hot after 9am. Business is tough these days, this is the off peak tourist season and not many tourists take the horse ride up these days judging by the number of horses awaiting for business. 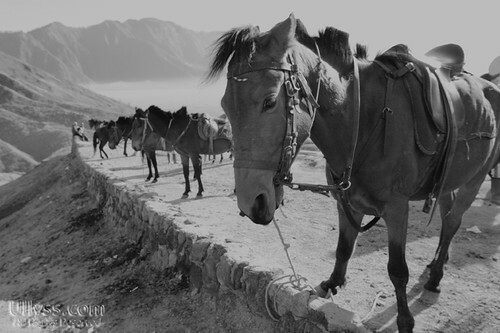 It was fairly easy ride up the Volcano on horseback, with parts of steep ascent, my skinny little horse had no problems walking up this steep portion along with its horsemen leading it up. Riding down the descent was a little uncomfortable strapping my 10kg camera bag on my back, it was a little challenging balancing myself with my heavy bag. 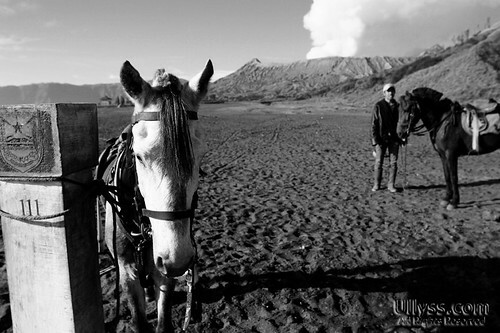 Horses lining up awaiting for tourists to take them down the Volcano. Most of the horses looked quite skinny and dehydrated. The view of the entire caldera from my hotel, Lava View lodge.